Recently I have had a number of discussions where the terms marketing, advertising and branding have been confused. Clarity on definition is important if you are responsible for working on developing a branding plan for your community. I like the following as a working definition – An insight informed communication idea that is executed synergistically across relevant touch points, designed to maximize the idea’s impact on a chosen target audience’s behavior. Advertising is a very specialized form of communication. Great advertising is built on an insight into your target audience’s buying habits that allows you to position your product or service in a way that opens their mind and heart (and ideally wallet). In economic development, advertising is the non-personal communication of information about your location. Typically, your target audience is capital investors. And, to be effective your advertising campaign will be built around a unique insight about the capital investment decision process, and the message will connect with the capital investor on both a rational and emotional level. Marketing focuses primarily on communicating (or correcting) and ensuring consistent delivery of your product or service image, many businesses opt to use the multi location marketing programs in order to achieve a great marketing strategy. The emphasis is on making certain the promise you make is understood and authentic. That promise must be relevant and competitive in order to be compelling. Advertising is one tool used in marketing. So are social media and promotional efforts to support capital investment lead management. Any interaction or communication about your location can be considered part of the marketing mix and will benefit from being in alignment with the core promise. My working definition for branding is the proactive management of your product or service identity. Marketing focuses on communicating or correcting the product or service image (present) while branding focuses on creating the identity (future). Because it is identity focused, branding includes a strong emphasis on strategic product development. A way to think about it is branding ensures your core promise remains relevant, competitive and authentic year after year. Good branding plans will have a 5 – 10 year planning horizon and a process for ensuring the plans are responsive to changes in the competitive environment. In economic development, branding guides choices on asset creation, infrastructure investment and public policy reform. When you are asked to brand (or re-brand) your location, take the time to clarify what the real expectation is. Often, the community leadership is simply asking for either a new advertising campaign or a marketing plan. Get aligned on what is really required and what resources are available. When talking with an Advertising Agency who is promising to create a new brand for your location, clarify what they will actually deliver. Typically it will not be a strategic plan that includes guidance on your community’s core promise and recommendations on asset creation, infrastructure investment and public policy reform. If it turns out the Agency is simply promising a new logo and tagline, walk away. It is a signal that they know very little about branding and you are about to waste your money. Another challenge that seems to come up in discussions I have with economic development professionals is that no amount of branding will make your location more competitive for capital investment if it lacks required assets. The fundamental wording of the challenge is convoluted. No amount of advertising will make a bad product (or location) good. That is absolutely correct. As one community leader once said to me “You can’t put lipstick on a pig and hope to win a beauty contest”. And, he was absolutely right. If your location is inherently non-competitive, job #1 is to invest in getting it competitive. My advice would be to not invest in advertising or marketing until you have a plausible chance for success. I would argue this is when branding is mandatory. You need a blueprint on how to make your location competitive. You need alignment on what the core differentiating promise is and the identity you want to create. Then you need to make informed choices on creating the right assets, investing in the right infrastructure and enacting the right public policy reforms to make your location promise authentic. The problem most locations have is that branding takes time, money and emotional commitment. Branding is about building prosperity that will stand the test of time. Branding requires genuine statesmanship and stewardship. Both of which are often in short supply. Leave a comment and share your experience with advertising, marketing or branding. How are you successfully using social media in your marketing mix? Thanks in advance. It is strange to read about such contradiction. Branding is a kind of marketing strategy and it’s realization. I would even call it “the way of consumer experience optimization”. I’m sure no one will argue with the fact that the customer experience is the marketing function. Branding is ensuring when the customer is looking for those needs to be fulfilled, they think of your product first. Marketing instead of the other way around. To me, Marketing Plants the Seeds…. Sales harvests the crops. Without marketing you won’t know who wants your product let alone be able to do a quality sales presentation to the buyer. Marketing HAS to come first…without it, your sales will falter badly. Great discussion and one that we are constantly having with our own clients in tourism. Interestingly, as digital and social have gained traction and interest on the part of marketers, some think of these tactics as superseding the need for a brand strategy. For many companies, any well executed tactic can move the needle so they keep falling back on the urge to do that. What they fail to realize is that a good brand can actually increase conversions/engagement and lower the overall cost and ultimate need for constant promotions, campaigns, tactics etc etc…. Branding is about proving or backing up what you say. Rockford, Illinois claims to be an Aerospace community. We are backing that up by listening to our employers and infilling to improve capacity e.g. this news story released 11/28/11- Rockford Aerospace Industry Continues to Soar. While we were present and speakers it was the partners that stole the show. On stage was the two largest aerospace companies, the chairman of our cluster group, the heads of our three largest higher education schools, and several representatives of partnering high schools. This capped several years of analysis and partnership building interactions. Rockford is Aerospace! Our next opportunity to grow our brand is to fill these classes. Then to help the students get jobs with interested companies. Brands must fit each company’s size and established image–or lack of one. A large and already popular company’s brand serves to support marketing campaigns in a general way, cementing existing relationships with its many customers and prospects. The logo of a sports team, for example, keeps fans committed by making them feel included as members of an extensive but cohesive crowd. The evolving brands of most medium sized companies should increase the company’s new credibility, and its position as a future industry leader. Startups, sole proprietors and some medium-sized companies should reinvent the traditional brand to reflect social and business changes. It should have the kind of edge that attracts prospects who don’t yet realize they need the company’s product(s) or services(s). The saturating effect of corporate branding described in the book “No Logo,” and the fact that consumers are increasingly seek business collaborations that are voluntary, temporary and tactical, means a small business owner or entrepreneur must get creative and think outside the box in order to gain traction in the marketplace. Their brand should be based on their nuclear core personal message or “Why” (see Simon Sinek’s excellent Ted.com video). It must make each prospect or customer feel the business owner has started a personal and important conversation. For these companies, copying a large corporation’s brand strategy in a misguided attempt to attract a mass audience is worse than having no strategy at all. 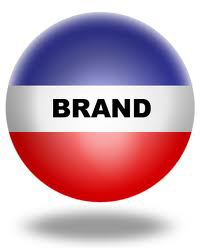 When I hear brand, I think about Lisa Gansky’s TED definition of a brand -A brand is a voice and a product is a souvenir. . I would offer: Strategy examines change and our insights into coping with change. Set objectives, discern the trends, opportunities, and threats that will shape ongoing performance. Once a way forward is grasped – establish metrics/targets to measure and control the forward progress. I am always disappointed when I hear people confusing the two. Understanding the difference allows the organization to better plan and execute their strategy. You brand is who you are. What you are. You don’t change your brand with a new slogan or a new campaign. Maytag is Maytag and Kenmore is Kenmore. New York City is the Big Apple and Indianapolis is Indy. Once you know what your brand is, your personality, your identity, then you can put together a marketing campaign that will emphasize your strong points, relate to your audience, and communicate with the market. Is Marketing suffering from brand thinking withdrawal? Brand and marketing were indeed intertwined but I believe as new thinking develops about creating experiences for customers & is replacing the thinking of broadcasting messages at consumers, we need to redefine things from the end user perspective rather than consider how brand & marketing are the same or different. Mad Men treated audiences as “viewers”. FMCG learned to deal with “consumers”. Service companies dealt “customers”. Today the biggest brands (Microsoft/Apple/Google) have “users”. Which “-er” dominates your brand thinking? I see Brand as the positioning of your product or company in the market. Brand should be directing all activities such as communications (including advertising) and services. Every activity within the company should be aligned with the Brand in order to create a consistent Brand. Marketing is in this perspective about defining customer needs and developing products and services to meet those needs in line with the brand (product-markt-customers). Marketing delivers the proof of where the brand stands for. I have a whole theory about Marketing & Branding differences which I can summarize in this parallel, but before that, I’d like to say that is not a versus, but a synergy in which one cannot exist without the other. The only cases where branding can exist without marketing is religion (not nowadays actually). Marketing. We connect at a product satisfaction level / Branding: We connect at an unconscious level. There are more differences, but as said, branding strategies can’t become true experiences without marketing and marketing can’t sustain sells without branding. whilst looking for an article simplifying the differences between marketing and branding I found this gem. It is very true people can often mistake marketing with branding because they don’t know the difference. Thanks for the clarification, great article.